On behalf of the Croatian Universities, the MoUs were signed by the Rectors of the respective Universities. Speaking to the media, the Chancellor of Shobhit University said- "we believe that the essence of the University is to create, integrate and disseminate better understandings of the world around us through knowledge. The purpose of these MOUs is to promote joint academic and research activities between the universities, and explore the possibility of student and faculty mobility between two countries. These MoUs will further strengthen our historical cultural relations, by developing common platforms for higher education, research, and innovation." 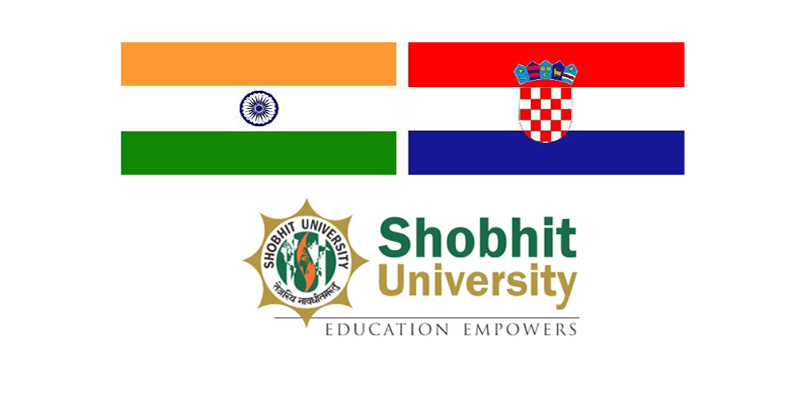 Shobhit University, India is a research-intensive, multi-disciplinary university that values high-quality teaching in a milieu of globally competitive, high-end research. Located in the historical city Meerut in India, the University provides quality education and boasts a strong focus on Agriculture-informatics, Biomedical, Bioinformatics, Biotechnology, and other niche areas of Engineering and Technology, Business Management, Economics, Psychology, and Legal Studies. The University's academic centers and its programs focus on education and research in specific disciplines and areas of study, and share the knowledge gained with the state, the nation, and the world. Our aim is to provide academic leadership in these areas and to develop strategic partnerships with academe and industry around the world to advance research, and the impact of that research, in these fields. Students from different states and countries bring the nation and globe to the University campus. The university has produced some of the finest Engineers, Managers, Researchers and Entrepreneurs. The strong Alumni Network, of more than 50000 graduates, extends throughout the World.